The At a Glance module is exactly what it sounds like! It offers an “at-a-glance” look at your blog’s posts, pages, comments, theme, and spam. Click on the links and you’ll be taken to the associated screen. There is a count of your total comments and spam caught by Akismet. 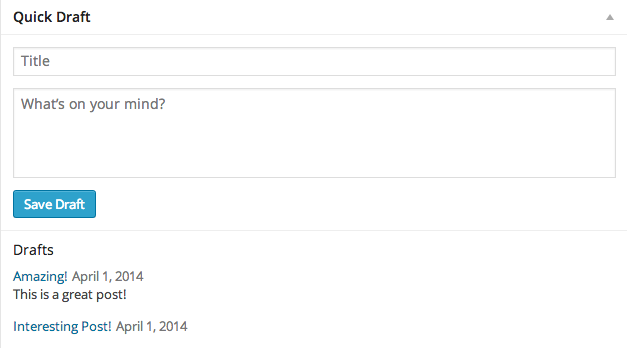 You can also click on the numbers to load the appropriate comments screen. Quick Draft is a mini-post editor that allows instant content creation from the Dashboard. You can include a title and body text in the post, and save it as a Draft. For additional options such as adding categories or setting a future publish date, you should use the Add New Post screen. Below displays links to your most recent drafts, allowing one-click access from the Dashboard. If you click on any one of them you will be taken directly to edit that post. If you hover your mouse over one of the listed comments, action links will appear, letting you Approve/Unapprove, Reply, Edit, See the History, Mark as Spam, or Trash. 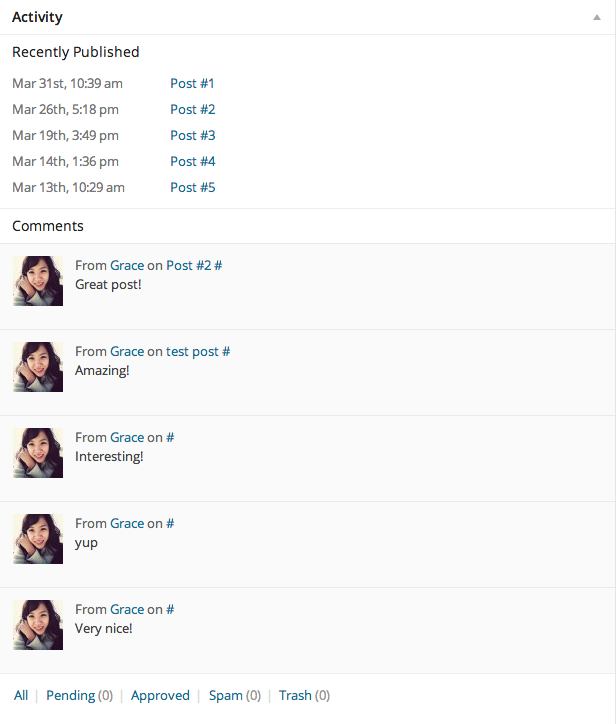 The Your Stuff module displays links to your recent activity on WordPress.com. The module will display links to comments you’ve left on other WordPress.com blogs as well as links to posts on any of your blogs where you’ve recently made changes. The Stats module is a favorite of many users. It’ll show you a graph of your blog’s traffic as well as links to some popular areas of your blog. The graph works just like the graphs on the Site Stats screens, so you can click a point to see more information about that day’s traffic. You can learn more about stats over here.